Building Information Modeling (BIM) is a model-based design concept, in which buildings will be built virtually before they are built in the field. Data models are organized to complete integration of all relevant factors in the building lifecycle which also manages an information exchange between Architects, Engineers and Contractors in the ecosystem, to strengthen interaction and have single source of truth. BIM is a single and shared source of information in decision making during building construction lifecycle. BIM offers enormous gains in saving time & cost with greater accuracy in estimation while making design with less alterations, less rework and maintains consistent data. 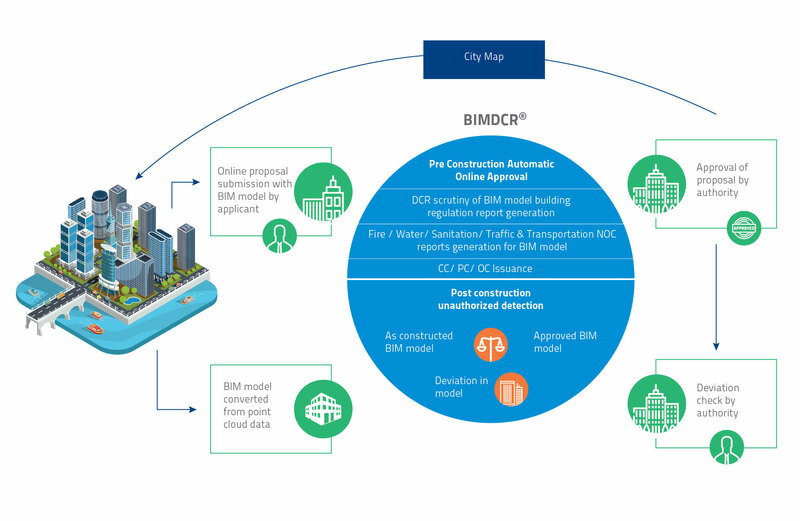 BIMDCR® is an innovative 3D Building Model based Online SINGLE WINDOW system. This is BIM based integrated Building Plan Approval System which enables automatic scrutiny of building proposal by reading Building Models submitted by Applicant/Architect. Different version of 2D drawings submitted to different departments results in rework and redundancy. Currently the various service departments from where NOC is required for building permission (like Water Supply, Drainage, Fire etc.) refer to different version of 2D drawings created by different consultants. Details of entire life cycle of building are missing for monitoring. Real time monitoring of unauthorized construction is not possible. Tracking of revenue/property tax is difficult in the absence of data. Difficult to bring together the different 2D views to visualize skyline, urban character, city growth etc. Single BIM model submission to various municipal departments will ensure change ‘Anywhere’ is change ‘Everywhere’. The chance of deviations in building plan approved by different department is possible. A Single 3D BIM model with layers of all services in same model will avoid this concern. Approved-Model v/s As-built model at various stages for CC/PC/OC approvals by utilization of building Lifecycle data. Unauthorized construction control at various stages of any project. 3D Visualization with BIM provides a better picture what a structure may look like in a plot/GIS city map. In order to provide Green Building Code compliance we need to have information of material used and building orientation parameters. It will be possible only through BIM model. CFD Simulation can be carried out. various Municipal Corporations along with the Local Language support. Clear view and easy analysis of the failed objects in the list stating the reason of failure.